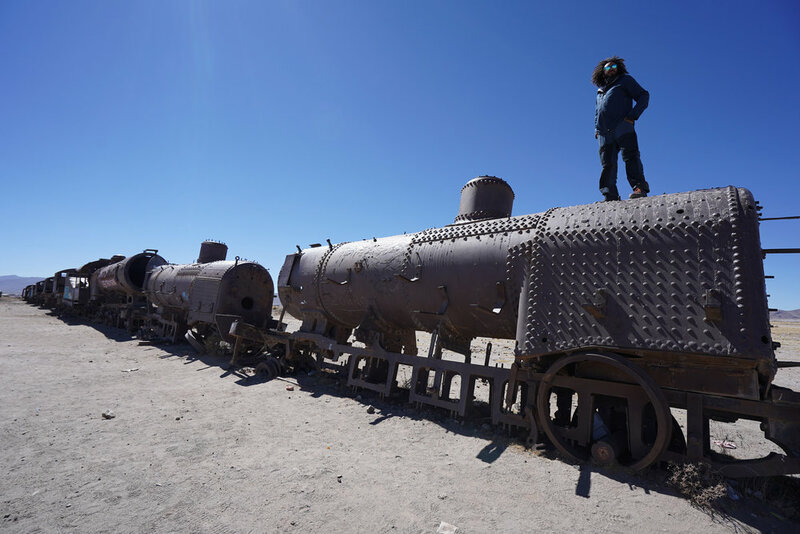 Inertia trip member standing atop an abandoned antique train by Uyuni in the rail cemetery. Drone shot of Machu Picchu showing many of the 200 buildings that occupy the site. Looking out from Machu Picchu to the surrounding mountainsides framed by a stone embrasure. Terraces of Salt evaporation ponds at Maras in Peru. Brine pond coloured in a deep scarlet red by algae at Salar de Uyuni. Workers in Maras, Peru working the salt ponds.